Create contact sheets or storyboards out of selected frames from a precomp or footage layer. Watch the demo video for more details on how to use the script. 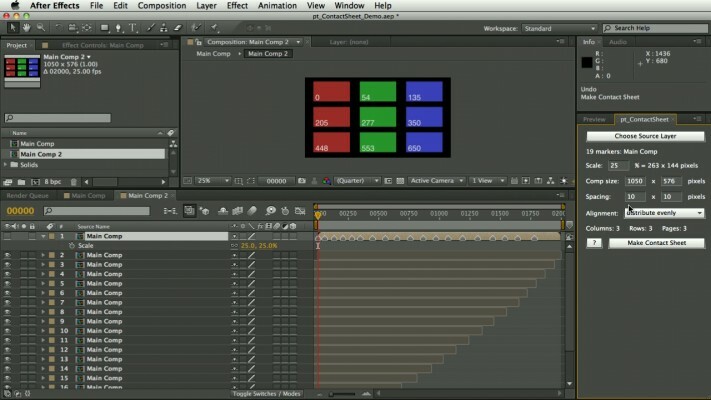 Place the footage or precomp into a new composition with the dimensions you want for your layout, and scale the layer down to the correct size. Add layer markers on the frames you want to include. 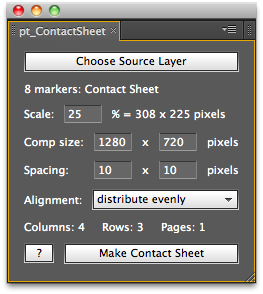 Only markers within layer in/out points are included, so you can trim the layer to specify a range of markers. With the layer selected, click the Choose Source Layer button and it will calculate how many columns, rows and pages will be needed to display all the frames. Adjust the settings if necessary, then click Make Contact Sheet and move to the first frame to see the first page of the layout. If you're not happy with the results, hit Undo, change the settings and try again. Scale: Set the scale of the frames. Defaults to the layer's current scale. Comp Size: Set the dimensions of the current composition. Defaults to current settings. Alignment: The frames can either be evenly distributed inside the comp, or aligned to the top left of the comp. Spacing: Add extra spacing between frames. Use a high Y value to make space for storyboard style comments below the frames.